Teas that combine ginger root and green tea leaves are available at natural foods stores under a number of brand names. Besides the complex flavor created by the mix of spicy, sweet ginger and brisk astringent green tea, the herbs in this blend offer known health benefits. Both green tea and ginger have been used for medicinal purposes. When consumed as a ginger-green tea blend, you get the best of both beverages. Green tea is made from the leaves of the Camellia sinensis plant, the same plant that provides leaves to make black and oolong tea. The difference between these teas lies in their processing. Black and oolong teas are created by rolling tea leaves to bruise them and release enzymes that break down vital substances in the leaves called polyphenols. This bruising process is referred to by the misleading term "fermentation," even though no fermentation actually occurs, according to the Linus Pauling Institute. Green teas do not undergo fermentation. To create green tea, Camellia sinensis leaves are sometimes withered, and then either steamed or fired. This preserves their polyphenol content. The polyphenols contained in green tea are antioxidants, substances that neutralize unstable molecules called free radicals that can cause cell damage. According to the University of Maryland Medical Center, green tea polyphenols may protect against coronary artery disease, help lower cholesterol levels and even help protect you against different forms of cancer. Green tea may also have a protective effect against diabetes, liver disease and inflammatory bowel disease. Research to confirm these findings is ongoing, but in the meantime, green tea is safe for almost everyone, though those with heart, kidney or psychological disorders or stomach ulcers should refrain from consuming it, as should pregnant and breastfeeding women. Ginger is the rhizome, or underground stems of the Zingiber officinale plant. The historic use of ginger as a traditional medicine spans Asia, India and the Middle East, according to the University of Maryland Medical Center. It is used in culinary applications and is available in herbal supplements as well in tea form. 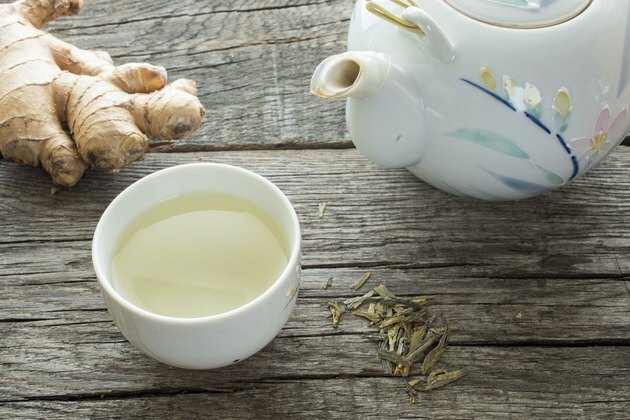 Teas made from ginger root have long been a go-to beverage for women suffering from morning sickness and, according to Armando Gonzalez, Ph.D. of the University of Texas at El Paso, the use of ginger in the treatment of hyperemesis gravidarum, or extreme morning sickness, has been confirmed by a number of studies. Ginger has also been used to stimulate the appetite and treat other forms of stomach discomfort, such as nausea and vomiting. Can Tea Help Calm an Upset Stomach?